Georg Gschaider, born 1971, Dipl. violin maker and Dipl.Ing. Maschinenbau (mechanical engineering). Why did we become violin makers? Barbara:"When I was 16, I got me first viola and I did fall in love with that instrument immediately. The arching and the varnishing was just so beautiful and it did respond so well I could not stop playing. From this moment I wanted to know how violin sound works." Georg: "I just love music and musical instruments, especially the beauty of the violin family. The traditional work which has not change for the last 400 years. I liked the idea of a "secret" that had to be discovered. I have a much wryer view about that now. But it still kept the appeal." What skills do you need for being a good violin maker? Barbara: "It is very important that you love the material and the craft. Maybe even more important: You must feel comfortable being on your own. If you want to make excellent instruments, you must listen to the wood. So I need a very quite place for work." Georg: "I think it is important to understand how a violin works. The violin vibrates differently in the middle than around the edges. I really have to understand that principle to make a good instrument. What is the "secret" of your instruments? Barbara: "To make our instruments sound like the Italian original we must copy the idea behind the instrument, not the measurements." Georg: "Barbara and I are very different: I am the scientific type of violin maker who analyses how the tone is affected by changes of the instruments. Barbara sees or hears an instrument with the eyes and ears of a musician. She plays the viola herself, finds what is lacking and changes that. These different approaches makes us a perfect team." The tow of us after the Diploma show at the Newark School of Violin Making in England. We just finished a three year course in violin making and a one year course in baroque instrument making. 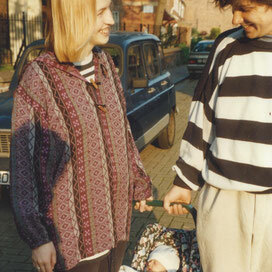 Now we are heading for Germany, accompanied by our wonderful five week old baby. 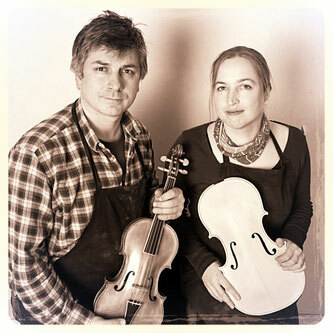 After having spent some years in the workshops of experienced violin makers, we set up our own business. 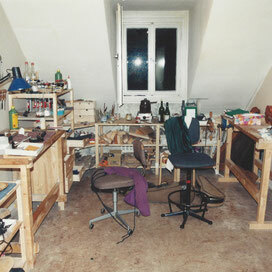 Our workshop was just a little attic room. Despite the lack of space and money we were really passionate about our work. Our little baby is an adult now, and our workshop has grown to a 80 m² studio. Our instruments are played in many European countries.